The Winter Solstice is around the corner. The holiday season is among us. A New Year is coming. I am personally looking forward to the break. To family, friends and down time. I am sure you are too. Life continues to provide its ups and downs and as of late, I feel my heels dragging along. In times like this I find myself yearning for comforts and memories come to mind that warm. As usual, I was driving home the other day and listening to CBC, to a story about kids writing letters to Santa. I guess today it’s quite high-tech and you can email him. Canada Post apparently has volunteers that help Santa with all the responses. Whether you agree with the idea of Santa or not, I smiled remembering the days when we’d get a call Christmas Eve from Santa (aka Grandpa K). We’d be celebrating Ukrainian Christmas Eve at Baba and Dido’s house, the phone would ring and Tim and I would get our few minutes with the big guy. I think I learned who the ‘real’ Santa was when I was in my teens <head shake, so silly>. Do you put up a Christmas tree? I have antique tree that belonged to my great-grandfather. 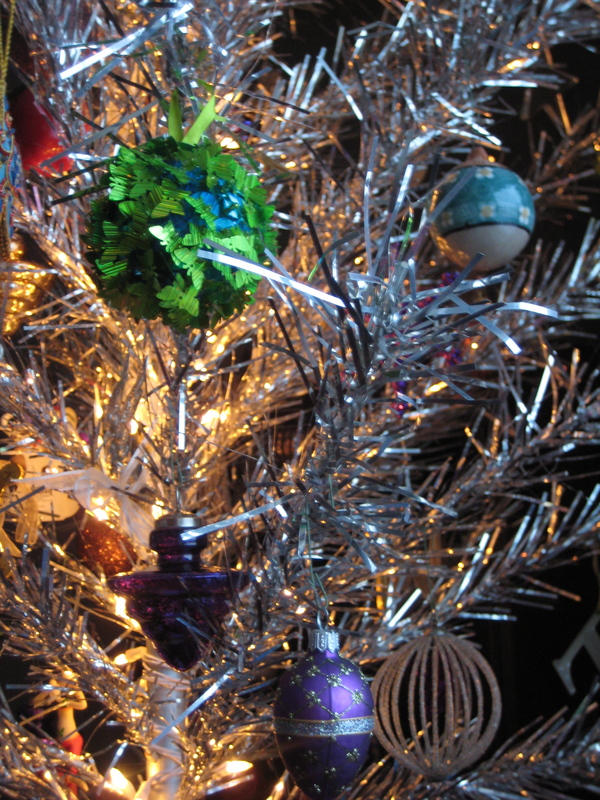 It is silver and I have memories of being in his little house and the tree sparkling at Christmas. I inherited the tree a few years ago and cherish it. Each year I buy a few new ornaments and have collected them throughout my travels. This year I bought three really pretty green and blue ornaments that are bunches of butterflies. Somehow they reminded me of my dear friend Jodie. This time of year has lost it’s meaning in mainstream. Focusing on family and friends, tree or not, is what this season is all about. 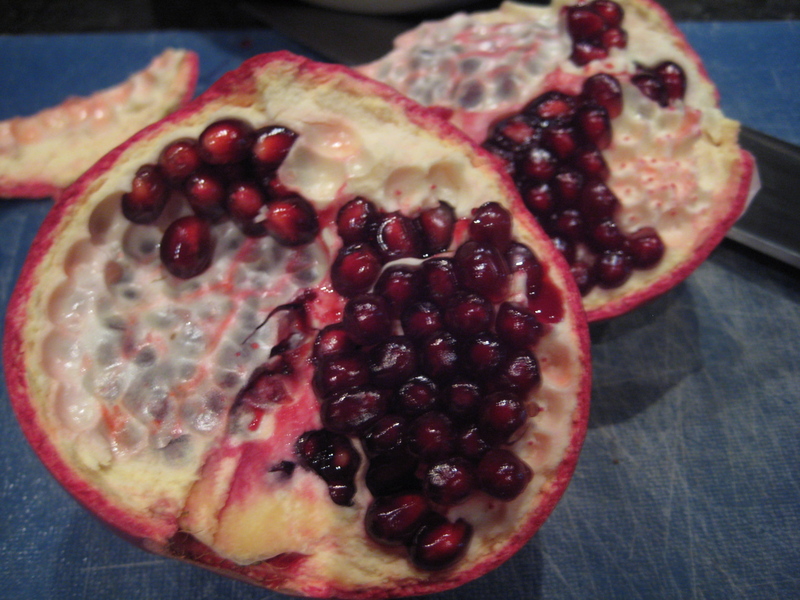 Another thing that I love this time of year, food related and healthy of course, are pomegranates. I love, love, love whole pomegranates. My dad use to cut them open for us and pick out the seeds into a bowl. Each of us with our own bowl of pomegranate seeds, sitting on the couch being super careful not to spill, eating them a few at a time. This fruit takes patience but it is so worth it. No juice from any bottle or pre-packed seeds even come close. Go out, buy some and enjoy the fruits of your labour (pun totally intended). The shortest day of the year draws near, the Winter Solstice on Dec 21. This time of reflection is a gift and should be cared for. T and I were married on the longest day of the year, June 21, and we always take a moment to reflect on the last six months and the six months to come. How are you spending time to take care?